The October meet at El Mirage and Bonneville News. This last Sunday we raced at the SCTA's El Mirage event. The Big motor is still not done (were told it will be ready for Bonneville) so we ran with the little motor again. We made a gear ratio change but it didn't help and we only got to 140.6 MPH. Since we knew that the dirt track was in bad shape we decided to only do the one run which proved to be a luck decision since the wind came up and slowed down the meet enough that only one round was possible. We managed to earn 177 points which while worse than last meet actually moved us up in the standings to tied for tenth/eleventh (with Leggett #500). I've discovered that when your tied in points, the lower vehicle number gets the lower number, this is bad for us since we have the last number. 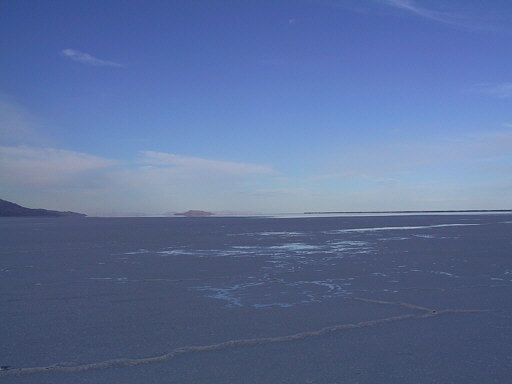 Were still on track to leave one week from today for the Bonneville Salt flats "World Finals. We decided to add Wally Ross as our crew member for this event. If other people wish to attend, please let me know so I can keep you up to date on the changing conditions. Right now there is still a lot of water on the salt and I would guess that there is still a 50/50 chance the meet will be canceled. We should get our big engine installed this week and the new scoop as well. Right now both are still in their respective shops but were assured that they will be ready.